Note: I tried to make this review as spoiler-free as possible, but you may want to tread lightly in the comments/feedback. Eight years is a long time. After the wanton chaos and destruction in 2008’s The Dark Knight, it’s hard to imagine Gotham City remaining in a peaceful state for eight long years, especially without their legendary protector, Batman. The man behind their hero, Bruce Wayne (Christian Bale), has also gone missing during this time. Now a recluse with a bum leg, Wayne spends his days locked inside Wayne Manor. It’s not until a run-in with master jewel thief Selina Kyle (Anne Hathaway) that Bruce musters up the will to do anything meaningful. Quickly he learns about the recent appearance of a monstrous villain, Bane (Tom Hardy), who is on a mission to destroy Gotham. Despite warnings from his loyal butler Alfred (Michael Caine), Wayne once again suits up as Batman to save his beloved city. That is a summary of the plot in its most basic form, but at a sprawling 165 minutes, there is a lot to digest. Bane’s planned destruction of Gotham is at the forefront, but a number of minor characters are introduced into the chaos, all of whom are tied into this in a variety of ways. Newcomer Joseph Gordon-Levitt has an especially crucial role as rookie police officer John Blake, a clever lad who acts as a bit of an understudy to Commissioner James Gordon (Gary Oldman) while also discovering Batman’s identity on his own. Two other newcomers play important parts in this ever-encompassing saga: Selina Kyle, aka Catwoman, who has a very complex relationship with Batman/Wayne, and Miranda Tate (Marion Cotillard), a philanthropist investor with an interest in Wayne Industries. All of these characters, and many old favorites, are seamlessly interweaved together to create a grand feature that can holds its own against the rest of Christopher Nolan’s trilogy. A strong case could be made for any of the three to be the “best” of the bunch, and right now I would put this a close second to The Dark Knight. A big reason why this film succeeds is because of its main villain. Every good superhero movie needs a badass adversary, and Bane is one of the best yet. Menacing and physically dominating, Bane is frightening nearly every time he is on screen. As I witnessed the destruction of Gotham City first hand, I was wondering just how the hell Batman and/or the city would make it out in one piece. Bane is as intimidating as I have seen any villain in recent years, and his bizarre face mask only adds to his daunting persona. There were a few moments where his mask would make it hard to understand his dialogue, and his audio did seem unnecessarily louder than others, but these are mere nitpicks. The dude is impressive, and he is a more than worthy rival to our legendary hero. For a film pushing three hours in length, there really isn’t a lot of “fat” here. Everything happens for a reason, and most plot devices are explained in depth for newcomers (or those who need a quick refresher). There are definitely moments in which a certain amount of suspension of disbelief will be required, including the much-discussed ending, but that is to be expected in a fictional universe like this. 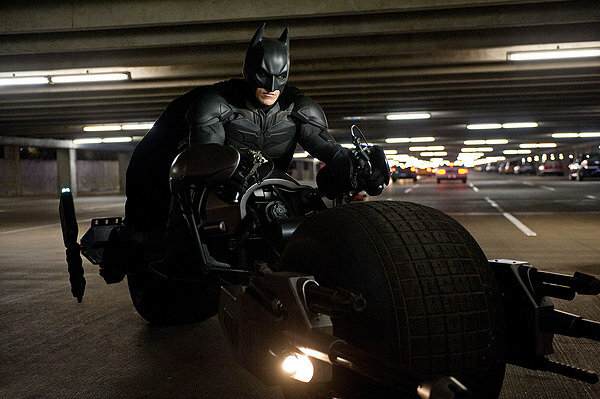 Taken on its merits, The Dark Knight Rises works exactly as it should. Is this a perfect film? No, not exactly. The weird audio problems with Bane are a little too noticeable, and I found occasional bits of dialogue from others that irked me the wrong way. There is one cop early in the movie, a very minor character, who has maybe three lines of dialogue total. Even though he was incredibly minute in the big picture, I winced every time he was on screen. Each line was forced and unnecessary, and it felt strangely out of place while in the middle of an epic car chase. Again, I am really nitpicking here, but that stuck with me for some reason. Regardless, tiny complaints aside, I couldn’t ask for a better conclusion than The Dark Knight Rises. The story, the cast, the characters, Han Zimmer’s score. All top quality. This is a film that demands to be seen on the big screen, and I would be hard pressed to find a better summer blockbuster this year. Glad you liked the film! I simply adored it and I can’t say the same about previous two films. The action was amazing, the score beautiful and the acting especially from Hathaway, Hardy and Bale was spot-on. Loved the ending, it was insanely moving and perfectly executed. I think that really says something since you loved the film but didn’t dig the first two. I agree — the ending was quite good and an excellent way to cap the trilogy. Thank you for this excellent review – we haven’t seen it yet but are thinking of going soon for a matinee. I’m not a fan of Bale but he did redeem his offscreen persona by visiting victims of the Aurora shooting. My husband and I LOVED the Avengers and just superhero movies in general. We are looking forward to Henry Cavil playing Superman. It looks like they have left the Christopher Reeves universe…finally. Thank YOU for the kind words! I don’t think you and your husband will be disappointed with TDKR at all. I rank it above The Avengers personally, but they are completely different in style so it might be unfair to compare them. As for Superman films, well, I am a little embarrassed to admit this but I have never seen any of them. That’s something I should probably fix soon. Your so welcome – enjoy your reviews! Read it out loud to hubby so he’s a fan too. I doubt I will feel the same when we leave the theatre for DKR vs Avengers and there are two reasons (going to go fangirl on you lol) 1) Chris Hemsworth and 2) Joss Whedon! When we left the theatre after the Avengers we both were so uplifted and energized – we saw Joss’s handywork all over it (love him from his days of Buffy the Vampire Slayer and Angel). Getting to see Chris wasn’t so bad either lol. If I remember, I’ll stop by after we see DKR and give feedback. Haha well somehow I missed out on ALL of Joss Whedon’s work until this year, and I don’t know how that happened. The Avengers and Cabin in the Woods have made me a believer, though. Really enjoyed both movies. Hope you stop back in after seeing TDKR! There’re an abundance of issues with this film — in particular its dealing with time, space, and reality — but I still managed to wholly enjoy it. Still, too many characters and subplots to be the masterpiece Nolan was aiming. It’s definitely the Return of the Jedi of its series. I think that’s a fair analysis, Sam. I can see how some inconsistencies, especially with time as you mentioned, could bother some more than others. I was able to overlook most of that, but they are valid concerns. Glad to hear you enjoyed it despite these issues. Good review Eric. This is just one of those epic flicks that seemed like it was destined for greatness right from the start and even though not everybody may agree with this, I think it absolutely exceeded that. My favorite of the year so far and I can only hope that it gets some sort of nominations come around Oscar time. One can only hope though. Thanks Dan. This may also very well be my favorite so far this year. Hi Eric, well as you’ve read my review, I definitely can’t say this is a perfect film. About the lack of ‘fat’ in this film, well I do think that Matthew Modine character, Foley I think is his name, is not very well-written and I think there are a few others that might not be necessary here. I do think this movie is sooo jam-packed that might deter my enjoyment a bit, but overall it is still a good film. 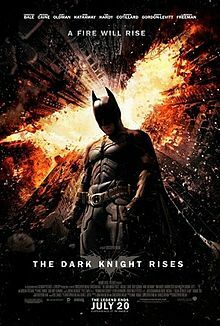 One thing for sure, the entire trilogy is still ace, and that’s something to be said considering Nolan didn’t originally envision doing a trilogy. Hi Ruth, I can see your point about Foley and others. I think a couple things could have been fleshed out a little better, but they didn’t lessen my enjoyment of the film at all. It was definitely an epic conclusion to an awesome trilogy. I went and seen this movie on Saturday. 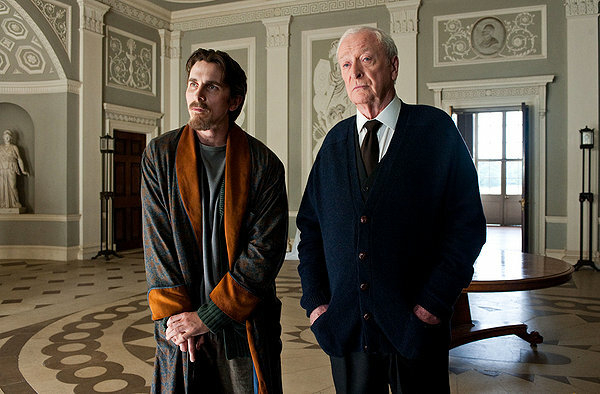 I liked Christian Bale as Batman and Bruce Wayne as always. Ann Hathaway did a pretty good job as cat women. I did not like Bruce getting beat so badly by Bain that he had to heal also I did not like how Bruce Wayne lost all his money and Alfred. But you have to loose everything to gain anything right. It was about him coming back. It was a good movie. I’m so glad you enjoyed it Eric. Like I said before I hope others don;t feel as disappointed as I did. Although I did secretly hope you’d hate it too! I’ll just hang out with Cherokee a lot more I guess. One thing I’ve noticed, Matthew Modine seems to be getting very little mention in reviews and for me was actually a highlight. toby in hate a blockbuster shocker…. hehehe I am JOKING!! 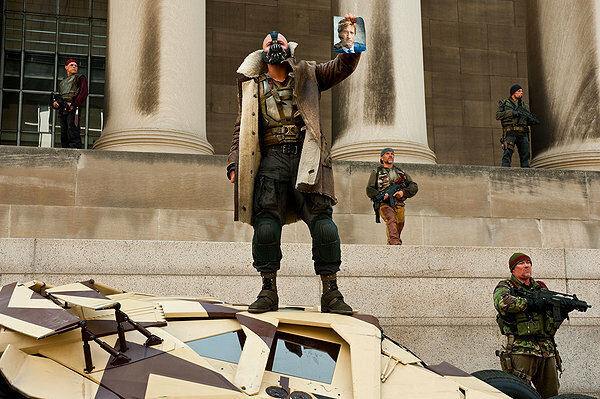 Haha, sorry I don’t get to join you in the depths of the anti-TDKR club, Toby. I honestly was expecting to be a little disappointed but was quite surprised with how much I enjoyed it as a whole — enough so that I am considering seeing it again in the theater, which is a rarity for me. That’s a great point about Modine. I forgot to mention him, but yeah, he was quite good. I suppose with so many important characters, his tends to get overlooked a bit. I enjoyed this as you know, but I didn’t love it. I have seen a lot of people re think their scores after multiple viewings… which is weird. Thanks Scott. Now I’m curious about those changing their scores… have their adjustments been for the better or the worse? Nice review, Eric. I came out about where you did on it — it’s a good film, and a good ending to the series, but definitely has its flaws. Sam Fragroso up above called it the “Return of the Jedi” of the trilogy, and I think that’s about right — a flawed movie, least of the three, but still a great conclusion to the trilogy. Thanks, Morgan. That does seem to be the general consensus — everyone seems to have enjoyed it overall, but the flaws were more glaring for some than others. Still, I don’t know if anyone could ask for a better conclusion. Happy to read you had such a good time with TDKR! I agree there is a lot to digest, so much that I need to watch it again before I can rate it. I had a few issues, Bane’s voice, too many characters, and the action not being as epic and original as I expected considering the 1/4 billion dollar budget. I think that’s a fair way to go, Chris. I definitely would like to see this again soon — will be interesting to see if my score changes with another viewing. Loved this film but I also found the Bane audio jarring. Noticed, as you did, very early on that his voice seemed to be noticably louder than everyone elses. Didn’t quite detract from the brilliant end to what I believe is the best trilogy ever! Not sure if I would go so far as to say this is the best trilogy ever, but it’s certainly up there! Bane’s voice took some getting used to, but I think it did get better by the end. Glad you enjoyed this one so much, Ben! Good review. I just don’t get how people could complain about anything in this movie. They probably went in with unrealistic expectations. Thanks, Brik. I think that a lot of people were going to be let down no matter how the movie turned out, but I suppose that’s bound to happen in one of the biggest trilogies of all time. Glad to hear you enjoyed it so much, too. I definitely agree with your overall assessment. I thought it was brilliant. A great way to end the trilogy. Awesome, Dan. It really was an excellent conclusion. Couldn’t have asked for much better.